Houston flooding is historic and linked to climate change. Houston area rainfall is off the charts on Monday. More than 1 foot of rain has fallen over the past 24 hours. 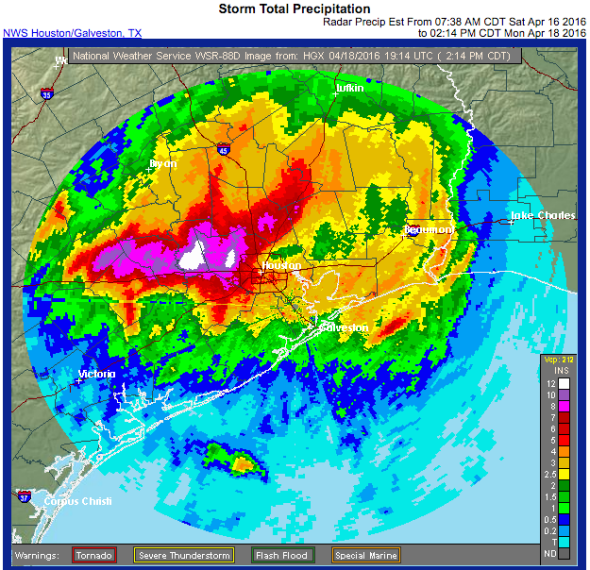 Update, April 19: The National Weather Service now reports that Monday’s rainfall total at George Bush Airport was 9.92 inches, Houston’s second rainiest day on record, next to 10.34 inches on June 26, 1989 during Tropical Storm Allison. Data from the NWS previously indicated a higher total, which would have been Houston’s rainiest day on record. The discrepancy was due to an equipment malfunction at the airport where the measurements were taken, the NWS says. More than 21,000 square miles of southeast Texas is now in a flash flood warning, but the worst flooding seems to be occurring in western parts of the Houston metro area. More than 17 inches of rainfall has fallen in just the past 24 hours in some neighborhoods, with about 1 foot of rain coming just since midnight—already making Monday the rainiest day ever in Houston before noon. At Houston’s George Bush International Airport, 11.16 inches fell by 10 a.m., breaking the all-time daily record of 10.34 inches set on June 26, 1989. And it’s still falling. More rain is in the forecast for the next 36 hours or so. Update, 6:35 pm ET: The rain has stopped for now, with 11.75 inches measured at George Bush Airport on Monday. Officials in Harris County, where Houston is located, have declared a disaster area and estimate at least 1,000 homes have already been flooded. More than half the watersheds in Harris County are experiencing significant flooding, with at least one cresting above its estimated 500-year flood mark, a new all-time record. Bayous and creeks have overtopped levees in some parts of Houston, and the water continues to rise, with downtown Houston also in the direct path of some of the worst floodwaters. The local NWS has warned residents not to travel “unless you are fleeing an area subject to flooding or under an evacuation order.” The NWS also warned of the risk of chemicals, ants, and snakes in flooded homes. About 120,000 homes are without power, and school and transit systems are shut down across the region. Emergency personnel in Houston have already performed hundreds of water rescues, with firefighters taking to boats. With lightning crashing overhead, one journalist helped rescue a man after he had driven into floodwaters that threatened to overwhelm his car. Another image of a man rescuing an armadillo was widely circulated on social media, and there’s also video of people teaming up to save a stranded horse. The National Weather Service had been warning of the potential for very heavy rainfall in southeast Texas since at least last Tuesday, as a continental-scale blocking pattern—in which an unusually stable jet stream locks weather systems in place—made conditions favorable for a stalled weather front to unload copious amounts of tropical moisture. Since the 1950s, Houston has seen a 167 percent increase in the heaviest downpours—defined as the number of days where total precipitation exceeded the heaviest 1 percent of all local events—one of the fastest rates of increase anywhere in the country. That’s exactly what’s expected to happen as the climate warms, since warmer air can hold more water vapor than cooler air. An increase in the frequency of heavy rain events has long been considered one of the likeliest consequences of global warming, and a recent comprehensive National Academies report endorsed this link. Blocking weather patterns like this weekend’s may be happening more often due to climate change, boosting the likelihood of heavy rainfall events, according to a new study published last week. This is at least the fourth major flood in the Houston area in just the past 12 months, with previous flooding events last May, June, and October pummeling Texas hard. The triangle between Dallas, Houston, and San Antonio is sometimes referred to as “flash flood alley” because of its dangerous mix of hilly terrain, sprawling urbanization, and frequent heavy downpours, adding to the region’s already considerable vulnerability to climate change.